Since the World Commission on Environment and Development (WCED), commonly known as the Brundtland Commission, coined the term “sustainable development” in 1987, the sustainability agenda has been widely debated in very different arenas. From a strategic management point of view, a key underlying question is how firms’ social and environmental practices relate to their economic performance, and to what extent adopting sustainability principles leads to the development of competitive advantage. This paper aims to discuss the role of stakeholder management and sustainability practices in the process of internationalisation. Managing stakeholders abroad is critical to the success of multinational corporations (MNCs), and this has been considered especially true when MNCs establish themselves in countries with different regulator y frameworks, institutional environments and socio-cultural contexts. Effective stakeholder management contributes to risk minimisation and can also give MNCs access to unique opportunities, for example, by developing new products to meet specific demands of local consumers or by having access to strategic resources. While most studies related to sustainability have highlighted the importance of stakeholder management for MNCs from Europe, United States and Japan, we still lack clarity on whether the issue of stakeholder management is equally relevant to MNCs from emerging economies. There is evidence that flexibility and institutional related capabilities of Brazilian MNCs, capabilities which were developed as a result of the turbulent environment that Brazil faced in the past decades, have been an important source of competitive advantage for these companies. The purpose of this paper, therefore, is to explore whether the adoption of stakeholder management and sustainability practices by Brazilian MNCs has influenced their international performance. Brazil is our unit of analysis not only because it hosts large MNCs, but also because sustainability concerns and the corporate social responsibility (CSR) agenda have received considerable attention in the country. Furthermore, there is evidence that flexibility and institutional related capabilities of Brazilian MNCs, capabilities which were developed as a result of the turbulent environment that Brazil faced in the past decades, have been an important source of competitive advantage for these companies. (Casanova2009; Cuervo-Cazurra 2008 and 2010; Haberer and Kohan 2007). These capabilities can be expected to help companies better engage with their stakeholders. The social and political aspects of managing stakeholders are especially relevant for the success of firms in foreign countries. When companies internationalise, they have to operate in institutional environments that are different from those of their countries of origin. Friedman’s classic argument (1970) that the social responsibility of business is to increase its profits to meet shareholders’ expectations has given way to the notion that companies should also take into account their impact on society and give due consideration to economic prosperity, social equity and environmental conservation. 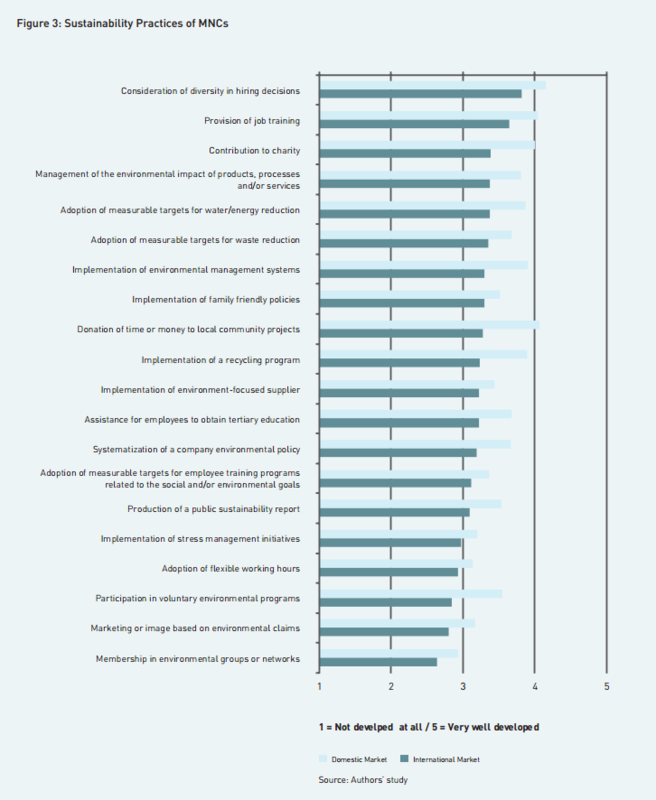 In fact, the adoption of sustainability practices by companies has been associated with several benefits arising from their enhanced reputation, such as customer loyalty, legitimacy and employee retention, as well as with positive direct business impacts as a result of more efficient operations and fewer risks and liabilities. In line with this sustainability agenda, firms have made considerable efforts to identify their stakeholders and respond to their expectations as part of their commitment to the social and environmental dimensions of sustainability. According to Freeman (1984), stakeholders are defined as “any group or individual who can affect or is affected by the achievement of the activities of a given company.” By including the needs and demands of stakeholders in their strategies, firms improve their competitive performance. The social and political aspects of managing stakeholders are especially relevant for the success of firms in foreign countries. When companies internationalise, they have to operate in institutional environments that are different from those of their countries of origin. Dealing with such differences may present particular difficulties also known as the “liability of foreignness” (Zaheer, 1995). Stakeholder management thus becomes a very important instrument to minimise risk in foreign operations. Bansal’s longitudinal study of corporate sustainable development (2005) gave support to the idea that MNCs have incorporated the concept of sustainable development in their operations. The study showed that the international experience of the firm is positively related to corporate sustainable development. As sustainable development becomes increasingly institutionalised, opportunities for value creation become more obvious. Brazilian MNCs, like MNCs in other emerging markets, were created and grew in a domestic market with an unstable institutional structure, which helped to develop their ability to adjust to other unstable environments. Historically, the lack of socioeconomic infrastructure and the persistence of social problems have encouraged Brazilian and Latin American companies to engage in CSR practices and establish more intense relationships with stakeholders such as the government and local communities. However, Brazil is different from other emerging markets because of its strong and effective environmental regulations. The social and environmental agenda is already part of the strategy of many Brazilian companies. In addition, Brazilian executives are able to adapt to different cultures and produce innovative responses in adverse situations and contexts. 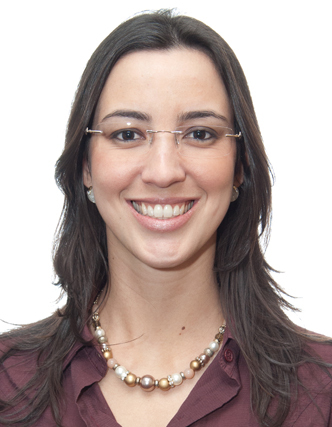 Research conducted by Professors Maria Tereza and Afonso Fleur y (2010) reveals that Brazilian MNCs have a different business model compared to non- globalised Brazilian companies. The MNCs’ model builds on the skills they have developed in the process of internationalisation – international orientation, participation in international networks and the ability to adapt to institutional, market and stakeholder’s demands – and these are increasingly related to social responsibility. Therefore, Brazilian MNCs seem to be well prepared to deal with the difficulties they may encounter in other countries. This observation aroused the interest of the International Business Knowledge Centre at Fundação Dom Cabral (FDC) in understanding Brazilian MNCs’ best practices for stakeholder management and sustainability. Brazilian MNCs, like MNCs in other emerging markets, were created and grew in a domestic market with an unstable institutional structure, which helped to develop their ability to adjust to other unstable environments. FDC’s research was conducted in 2011. We sent a questionnaire to managers of 48 Brazilian MNCs to collect data on their stakeholder management and sustainability practices. In addition, we conducted inter views with international managers of seven Brazilian MNCs who were responsible for formulating and/ or implementing their companies’ international strategy. Companies were asked to rate the level of participation of each stakeholder in their decision- making process, considering domestic and international markets separately. We measured stakeholder engagement by the degree of participation of each stakeholder group in operational, administrative and strategic decisions, as suggested by Hansen and Spitzeck (2010) (Figure 1). Brazilian MNCs were found to engage more intensively with stakeholders at home than with stakeholders abroad. Although engaging with stakeholders abroad might help Brazilian companies overcome the liability of foreignness, the lower level of engagement may also be a result of their difficulty in dealing with this liability. Furthermore, creating collaborations requires trust, which is built over time. Thus, another possible explanation for this result might be that companies need more time to establish relationships with stakeholders abroad. The survey also showed that Brazilian MNCs have a higher level of engagement with stakeholders directly related to their business than with external stakeholders. Shareholders and investors have the highest level of participation in strategic decisions. Brazilian MNCs also involve joint venture and alliance partners, clients and employees in dialogues on strategic decision making. Among external stakeholders, governments – both in the domestic market and abroad – have a direct influence on operational and/or administrative decisions of these MNCs. Furthermore, it is worth noting that companies have some degree of dialogue with the least engaged stakeholders – trade unions, non-governmental organisations (NGOs) and local communities – showing that it is important to take them into consideration. Figure 2 details the scope of involvement of Brazilian MNCs with these three groups of stakeholders in international markets. 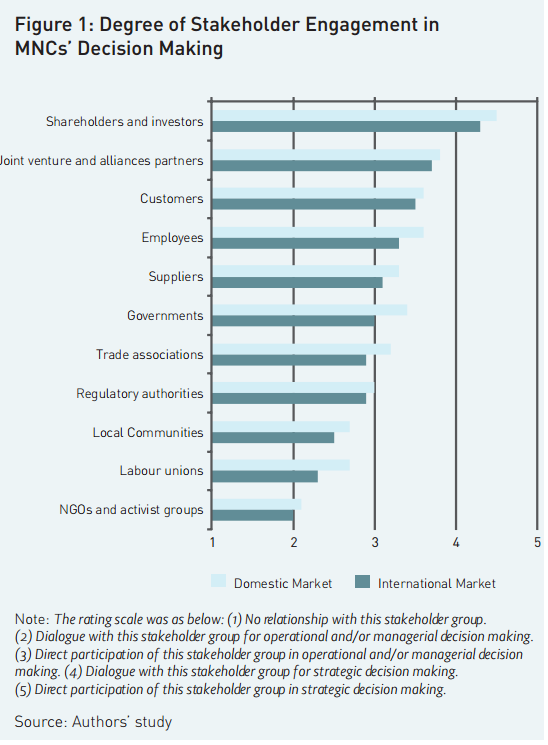 Despite the low level of involvement with local communities abroad, few companies have no relationship at all with this group of stakeholders (only 8.3%). However, there is a profound lack of engagement with NGOs and activist groups abroad, which can be an interesting challenge for MNCs in overcoming the liability of foreignness. The research also considered the degree to which 20 sustainable practices were developed by Brazilian MNCs in the domestic market and abroad (Figure 3). To enable a more rigorous statistical analysis, these practices were grouped into environmental practices, social practices – philanthropy, social practices – employees, and formalisation of practices. We conducted a statistical regression analysis, the results of which showed that engagement with external stakeholders is a significant mechanism to promote the adoption of sustainable practices in operations abroad. More specifically, the study showed that engagement with local communities has a positive impact on the adoption of environmental and social practices in foreign markets, but not in the domestic market. Interestingly, despite the higher level of engagement with communities in the domestic market, this stakeholder group exerts more influence on the development of sustainable practices by MNCs abroad. NGOs and activist groups directly impact the adoption of environmental practices in foreign markets, but not in the domestic market. Nevertheless, these stakeholders have no significant impact on social practices in any of the markets studied. According to Kolk and Pinkse (2006), in places where governments fail to regulate the environmental impacts of business, NGOs play an important role by increasing the external pressure on companies. Even though NGOs and activists have less power over the organisations than governments, the reputational damage that these groups can cause is of importance to companies. The study showed that engagement with local communities has a positive impact on the adoption of environmental and social practices in foreign markets, but not in the domestic market. The most relevant benefits to companies of adopting sustainable practices abroad are improving their relationship with stakeholders and improving their brand or image, followed by the creation of competitive advantages. 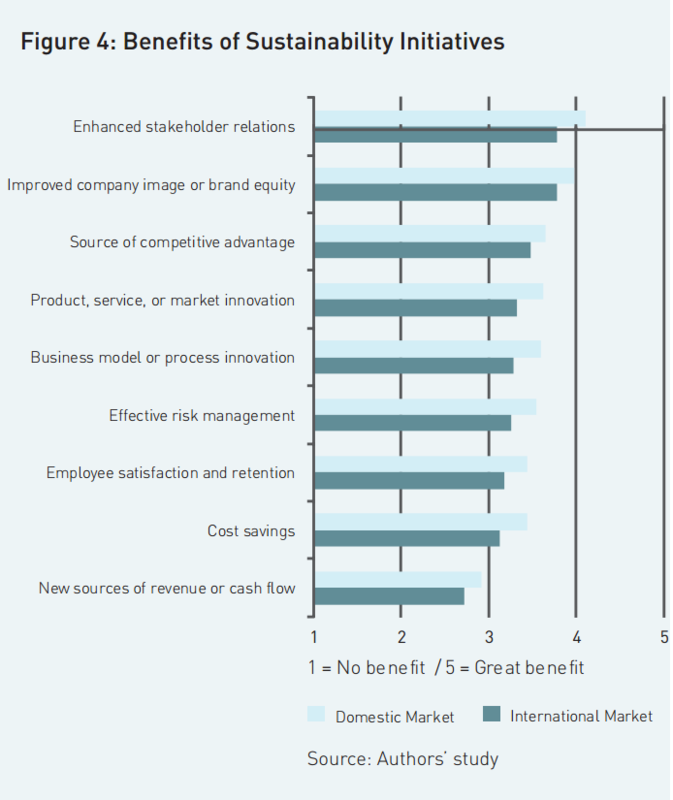 Apparent benefits are high in the domestic market, but it is also possible to identify similar trends in the international market (Figure 4). Some Brazilian companies revealed that they consider their investments in sustainability to be a preventive action, because their lack of problems with stakeholders is already a great benefit. Other MNCs said that they have been invited to enter new foreign countries because of their positive image with respect to developing sustainable practices in other foreign countries. This bonus can be interpreted as a source of competitive advantage, demonstrating that sustainability practices can create new business opportunities for companies. To measure their competitive advantage abroad, we asked companies to examine their satisfaction levels with their market share and with their performance relative to competitors, both domestic and international. This methodology allowed us to compare companies from different sectors and of different sizes. It also facilitated the analysis of competitive advantages, considering that they are dynamic and relative to competitors. We performed a statistical regression analysis to determine whether the adoption of sustainable practices has influenced companies’ satisfaction with their performance abroad. We found that the most significant variable was the adoption of social practices related to philanthropy, followed by the adoption of environmental practices. Social practices targeted at employees do not have great relevance to MNCs’ performance satisfaction. The adoption of philanthropic and environmental practices by Brazilian companies helps explain the competitive advantages they have obtained in their internationalisation process. However, the fact that social practices related to employees were not considered a significant factor by managers shows that companies do not yet perceive CSR to be a source of competitive advantage. They seem more focussed on their reputation and minimising risks, without realising that social investment in employees can be a without realising that social investment in employees can be a source of competitive advantage abroad. Another important result was the positive impact that company size (measured as total revenue) had on the adoption of social practices; i.e., in engaging with NGOs and local communities, larger organisations and employee engagement, both in Brazil and abroad. Some studies argue that there is a positive size-corporate social performance (CSP) relationship, while others studies have also found that firm size leads to a positive relationship between CSP and financial large firms have more resources to devote to social programmes and a larger asset base over which to maintain higher levels of CSP. Nevertheless, size was found to have little or no effect on the adoption of environmental practices, both at home and abroad. In the international market, this might be because NGOs and local communities are pressuring MNCs to control their environmental impacts, no matter what their size. The aim of this paper was to compare stakeholder management and sustainability practices of MNCs at home and abroad. Results indicate that Brazilian MNCs engage more intensively with stakeholders in their home markets than abroad. However, engagement with NGOs and local communities are more effective abroad because these stakeholders stimulate companies to adopt environmental and philanthropic practices. We also found that the adoption of sustainable practices, especially environmental practices, by companies has an impact on their satisfaction with their international performance. These results confirm that concern with sustainability helps these companies develop competitive advantages in the internationalisation process. The study reveals an important lesson for MNCs: engaging with stakeholders at home and abroad improves the relationships and reputation of companies. Managers of MNCs might, therefore, be well advised to adopt stakeholder management and sustainability practices abroad. Community leaders, NGO managers and activists in foreign countries may also find it interesting that their engagement with Brazilian MNCs operating in their countries could have a positive impact on the level to which these companies adopt sustainability practices. As a result, one can argue that stakeholder management may be considered an effective mechanism for increasing the sustainability of MNCs abroad and a source of competitive advantage for these companies in the global market. Bansal, P (2005). “Evolving Sustainably: A Longitudinal Study of Corporate Sustainable Development”, Strategic Management Journal, 26(3): 197–218. Casanova, L (2009). Global Latinas: Latin America’s Emerging Multinationals (New York: Palgrave Macmillan). Cuervo-Cazurra, A (2008). “The Multinationalization of Developing Country MNEs: The Case of Multilatinas”, Journal of International Management, 14(2): 138-154. Cuervo-Cazurra, A (2010). “Multilatinas”, Universia Business Review, 1st quarter: 14-33. Fleury, A, M Fleury, and G Reis (2010). “The Path is Made by Walking: The Trajectory of Brazilian Multinationals”, Universia Business Review, Q1: 34-55. Freeman, R E (1984). Strategic Management: A Stakeholder Approach (Boston: Pitman Publishing). Friedman, M (1970). “The Social Responsibility of Business is to Increase its Profits”, The New York Times Magazine, September 13. Haberer, P R, and A F Kohan (2007). “Building Global Champions in Latin America”, McKinsey Quarterly, 43-49. Hansen, E and H Spitzeck (2010). “Stakeholder Governance: An Analysis of the BITC Corporate Responsibility Index Data on Stakeholder Engagement and Governance”, Mimeo, Cranfield University, Cranfield. Kolk, A, and J Pinkse (2006). “Towards Strategic Stakeholder Management? Integrating Perspectives on Sustainability Challenges such as Corporate Responses to Climate Change”, Corporate Governance, 7 (4): 370-378. World Commission on Environment and Development (WCED) (1987). Our Common Future (Oxford, UK: Oxford University Press). Zaheer, S. (1995). “Overcoming the liability of foreignness”, Academy of Management Journal, 38(2): 341-363. Associate Professor of Strategy, Fundação Dom Cabral, Brazil.